In February 2018, journalists demonstrated their opposition to the new law using the hashtag #IamASpy, referring to the law's provision of espionage charges against those who handle classified state documents. Screenshot from Facebook. 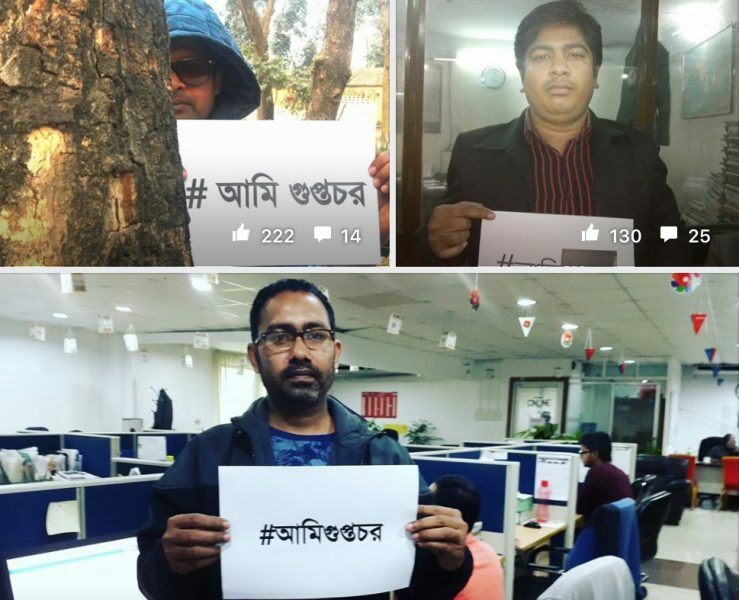 On September 19, the Digital Security Act 2018 was passed by the parliament in Bangladesh, with just 11 lawmakers opposing the bill, despite widespread opposition from journalists and human rights advocates. Intended as a replacement for Bangladesh's ICT Act, the Digital Security Act criminalizes various types of online speech, ranging from defamatory messages to speech that “injures religious values or sentiments.” It also authorises lengthy prison sentences for using the internet to create public unrest, and for “gathering, sending or preserving” classified government documents using a digital device. With the next general election approaching in the coming months, some speculate that the law is intended to stifle criticism of the ruling party and the spread of disinformation online. The Act was introduced as part of the government's “Digital Bangladesh” agenda – a framework for bringing the country's services, government, private sector and citizens into the 21st century with technology. The Bangladeshi The Editors’ Council, made up of editors from numerous Bengali news outlets, said they consider the Act to be “against the freedom guaranteed by the constitution, media freedom and freedom of speech.” International media and human rights groups, including Human Rights Watch, have also condemned the law. In response to critiques, Prime Minister Sheikh Hasina has suggested that there is nothing for journalists to worry about. “Journalism is surely not for increasing conflict, or for tarnishing the image of the country,” she said in a speech before parliament. Section 21 says anyone spreading propaganda against the Liberation War or the notion of it or the Father of the Nation using digital devices will be sentenced to up to 14 years in jail or fined up to Tk 10 Million (US$125,000) or both. Section 25(a) authorises sentences of up to three years for publishing information that is “offensive and threatening” or anything that tarnishes the image of Bangladesh. Section 29 authorises up to 3 years in prison or Tk 500,000 (US$6250) fine if a person publishes information with an intent to defame someone else. Section 31 authorises 7 years of imprisonment or Tk 500,000 (US$6250) fine or both, for the deterioration of law and order by creating unrest or chaos or creating enmity, hatred between communities and hampering communal harmony. Section 32 authorises up to 14 years in prison for gathering, sending or preserving classified information of any government using a computer or digital device terming it as espionage – striking a blow for whistleblower’s rights. The Act also calls for establishing digital forensics labs and a Digital Security Agency, alongside a national computer emergency response team and an 11-member Digital Security Council. Specifically, the group expressed concern about provisions within the Digital Security Act which “create an impediment” for citizens to acquire information from the government. This would sit in contrast to the Right to Information Act, which was passed in 2009 to improve transparency and accountability in government by allowing citizens to file formal requests for government documents and data. The new legislation also brings in historic elements, invoking the colonial-era Official Secrets Act. This trend can also be seen in neighbouring Myanmar, where two Reuters journalists were sentenced to seven years in jail in early September, under their colonial-era Official Secrets Act. Posts, Telecommunications and IT Minister Mustafa Jabbar had previously announced that the new Digital Security Act would replace Section 57 of the previous Information and Communication Technology Act 2006, which had also been criticised by rights activists and journalists for the way it was used to target and punish journalists. Most recently, photographer and journalist Shahidul Alam was charged under Section 57 after posting extensive coverage of student protests in Dhaka and giving an interview to Al-Jazeera about the protests. He remains in prison after more than two months. But the final text of the Digital Security Act expands and reinforces this section, instead of repealing it as promised. And despite Jabbar’s assurances in May 2018 that “necessary amendments so the freedom of the press does not get hampered”, the Act passed without any major reforms. The Editors’ Council will stage a human chain protest against the Act on September 29, in front of the National Press Club.